The observance of the Black Day is aimed at registering protest against the killing of top Hizbul Mujahideen commander, Burhan Wani, his associates and 48 peaceful protesters by Indian troops and police since 8th July 2016. Pak Australian condemns Indian brutalities on the innocent people of the occupied territory. The High Commissioner for Pakistan Her Excellency Naela Chohan and Defence Advisor Brig Muhammad Asghar explain the audience in Canberra about the background of Black Day (20 July). Black Day is being observed across the Australia and Pakistani Community living in different states expresses solidarity with the Kashmiri people and lodge protest against grave human rights violations in Occupied Kashmir. Even it was working day, Few Functions are being held in Australian capital and other important places to draw attention of the world community towards the burning issue of Kashmir. 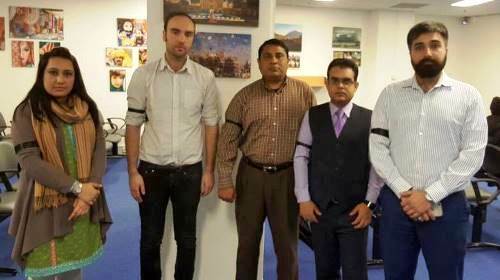 The Pak Diplomats and People of different countries were wearing black arms band duty to express political, moral and diplomatic support to Kashmiris. Special prayers were held in Canberra, Sydney, Melbourne and Perth after Zohar prayer for martyrs of Kashmir. Joining our Kashmiri brothers & sisters in their fight against the century old oppression, BLACK DAY was observed today in Sydney, New South Wales to express solidarity with the people of Indian Occupied Kashmir. On this occasion, Consulate General of Pakistan arranged a Fateh Khawani for innocent civilians who have lost their lives in the recent turn of events in Jammu & Kashmir at the Rooty Hill Mosque & Islamic centre Sydney. A large number of people and students attended the pray. The Imam of Rooty Hill Dr Mufti Tariq Asadullah and Consul General Abdul Majid Yousafani briefly talks about the Indian brutalities on the innocent people of the occupied territory than Special Dua was held for martyrs of Kashmir.